Staff from the UCLA Vine Street Clinic recently participated in a mural design project with the Hollywood Police Activities League (PAL) and Arts Bridging the Gap. PAL is a community-based program that provides youth with positive alternatives to drugs and crime. 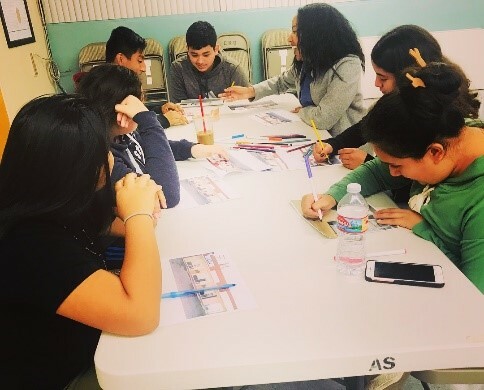 Arts Bridging the Gap also supports youth by linking together artists, educators, and community organizations to create meaningful and impactful art in the community. Our staff spent an afternoon brainstorming ideas with members of each organization, kids from the community and a local artist to come up with some beautiful designs. One drawing will be chosen as the basis for the mural to be installed at our clinic this Spring! The mural is part of the Los Angeles street art initiative that brings underserved youth, LAPD officers and members of our community together to create public art pieces to elevate community pride and engagement in our city.